output-board features eight 10A relays and four 0-10V proportional outputs, making this board really suitable to control loads wirelessly. Output-board works out of the box with our binouts sample application for panStamp so anyone owning this board will be able to control things without having to write a single line of code. 8 x Relays: 10A @ 230VAC, 7 with NO and NC contacts and 1 with NC contact. 4 x 0-10V outputs: low-current control signals. Status LED for each relay. Relays are rated for AC mains use but you should only consider connecting relay outputs to mains if you really have the necessary skills and experience. Mains voltage can kill so proceed at your own risk. The current version of this board (v.1.2) has a typo in the top silkscreen. 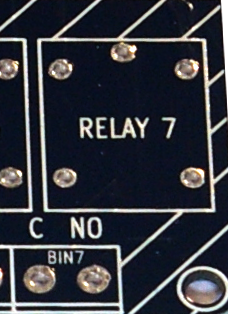 Relay output 7 does not provide a "normally open" output but the silkscreen shows the opposite. output-board can be purchased from our store with DIN-rail / wall-mountable enclosure as an extra option.